Somehow it is already time for week 10 of Living Arrows. It seems only yesterday I was writing last weeks! The last week does seem to have been taken up mostly by being ill though. Let’s hope this week is a healthier one! I think last week I had a grand total of 2 days (not consecutively) where I wasn’t ill in some way or another. One of those was Sunday. So as the weather was nice, for part of it, we packed up the car and headed to the allotment. I feel like I’ve really neglected the allotment over the past year or so, but I’ve had my hands a little full! I could probably count on one hand how many times I’ve been down since she was born, which is a real shame, as I really do love spending time down there. This time we took a spare travel cot with us, and some toys so that Isla could play in there while we were getting on with bits and pieces. But she was having none of it! She did not want to play in there at all, and so Daddy ended up having cuddles with her, and wandered round the other allotments, and she finally fell asleep. In the mean time, I was making a make shift raised bed, and then planting up some garlic. Then it was time to swap over and I sat down and had sleeping Isla cuddles, while Chris did some weeding and sorted out the shed (We share out shed with someone else who we share a plot with – we have half, they have half, and it turns out our plot neighbour has handed her plot back, so the shed is mostly empty now. I didn’t realise she had so much stuff in there until now! So we Chris was able to organise what we had in there). Isla was very happy when she woke up and wanted to have a wander around the allotment, and I decided it would be a great opportunity to take some photos of her. I love this photo as she is so so smiley in it, and just sums up how happy she almost always is. 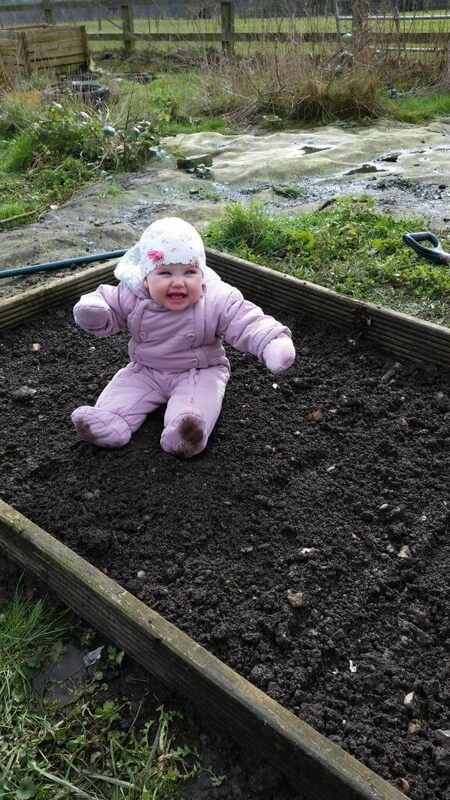 She thought it was hilarious that we had put her in the middle of a bed on the allotment. Nevermind Cabbage Patch Babies, she’s my little Garlic Patch Baby! Look what we’re growing on our allotment! It felt so good to get some fresh air and do some work down at the allotment. I’m hoping that Isla will soon be happy enough to entertain herself at times when we’re down there so that we can get a good amount of work done, rather than Chris and I having to play tag team over who gets to work and who gets to look after Isla. 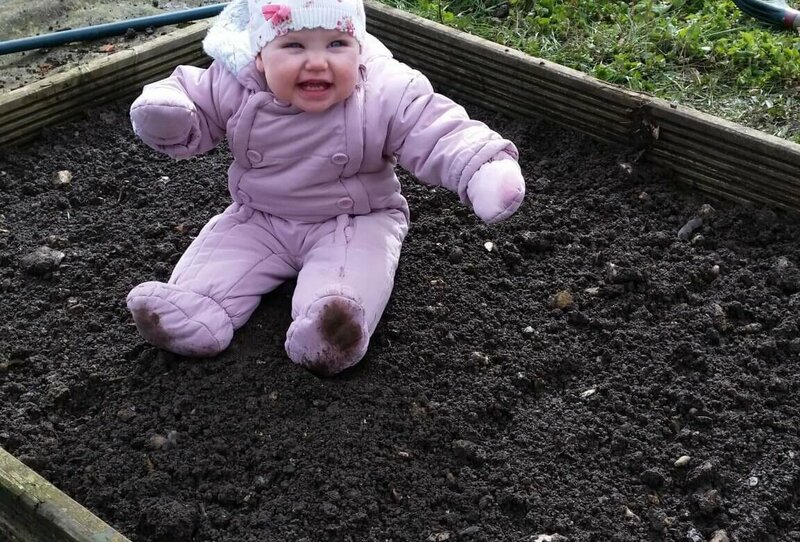 I also can’t wait until she’s old enough to be able to have her own little section of the allotment so that she can do bits of digging, and grow her own bits and pieces. Let’s see what the next week brings in terms of Living Arrows! What a cutie! I’m sure Isla will love having her own little section of the allotment in yeras to come. She looks sooooo happy! Bless her! I’d love to have an allotment, she looks so happy to be there too! I’m hoping to get hubby out in the garden soon so we can dig up the sides to make a vegetable patch! I’d love to get my boys out there!